A special prize to anyone who might be able to respond and tell me where this artwork is found, the author, and the name of it. It is a pretty easy question, so chime in and let me know. I'll try a harder one as we go along. Today's Scripture reminds me of this image and specifically in verses 20 and 46. Jesus chastises those who doubted him as far as from where his power came. He speaks about the finger of God being able to cast out demons even as the above depicts the creation of Adam. Sorry, did I give it away? But then again in vs. 46 he scolds them for not being willing to lift a finger, to use their power, in order to ease the burden of the people surrounding them. The people were cowering under the pressure of doing the right thing and following rules and regulations as opposed to following the response that is natural when we react to the love of God. The rules and the regulations constantly changed depending on who were the religious leaders of the day. Rules should serve to open our ability to love God, and not to imprison us withing a structure that doesn't allow us to see God's love through the legalism that might exist. I love the metaphor that Jesus gives when he tells a story of a neighbor knocking on your door at midnight because a guest just arrived and he had no food. First of all, what guest arrives at midnight? Maybe the one who had come from miles and miles away on foot and ran into difficulty and the only person that he knows is you. You just might happen to be the only family that he might know within a 20 mile radius or a day's walk. So he came when he could and needs shelter and food. This is not a scenario that would ever happen, or at least very rarely happen, in our day and age. But this was pretty normal in Jesus' day. This is why hospitality is so heavily stressed throughout Scripture. Because people were on the move and things happen, then you have to be ready to receive those who might need your help. We have developed systems now instead where people can stay or where they can get help whether they know anyone in that town or not. The point is that if we succumb to the pressure of an insistent neighbor then how much more will a loving God succumb to a persistent child who comes daily to him in prayer? 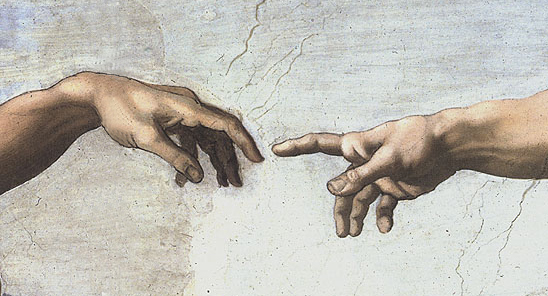 The Creation of Adam, Or the fingers of God, in the Sistine chapel painted in 1511-1512 by Michelangelo.